Are you getting married soon? Why not try these adorable and quirky pre-wedding shoot ideas and have a local essex wedding photographer capture the emotion and excitement ahead of your big day! If you’re an animal lover and they’re an important part of your family and day-to-day life, go ahead and incorporate your pet into your pre-wedding shoots! You could have them sat in front of yourself and your partner looking cute, with a plaque around their neck saying, “Save the date!”. The photo will make for a cute keepsake, and will look great on wedding invitations! If you want to make your photoshoot look out of this world, then an aerial photoshoot is for you. You can capture beautiful scenes with a drone, as they have very powerful cameras (like a GoPro) strapped to them. Photography drones produce beautiful, cinematic aerial shots, providing a macro view of your pre-wedding shoot that no one gets to see. Like destination weddings, couples are now going for destination pre-wed shoots. From London’s twinkling night sky to Budapest’s charming town squares, more and more people are investing in a photo shoot with spectacular locations that offer a stunning backdrop to your romantic day. Pre-wedding shoots are really popular, particularly in destinations such as Paris, Italy and Santorini. If you really want to have a pre-wedding shoot abroad, it’s important to find a wedding photographer that is happy to travel abroad and has time in their schedule to dedicate time to getting the perfect shots for you. 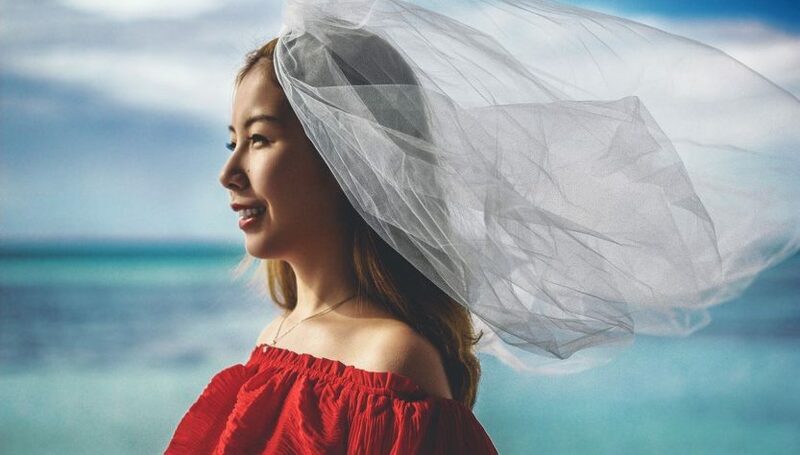 Arty-style photo shoots are becoming more and more popular on pre-wedding shoots, with dates scribed into objects like coffee cups and on the back of shoes, or having couples sat in unusual environments like row boats adorned with rose petals and tealights. Photoshoots are also taking place in unusual environments, such as quirky little cafes, rustic side streets and on isolated beaches. Enjoy your pre-wedding photoshoot with your chosen wedding photographer and have fun!